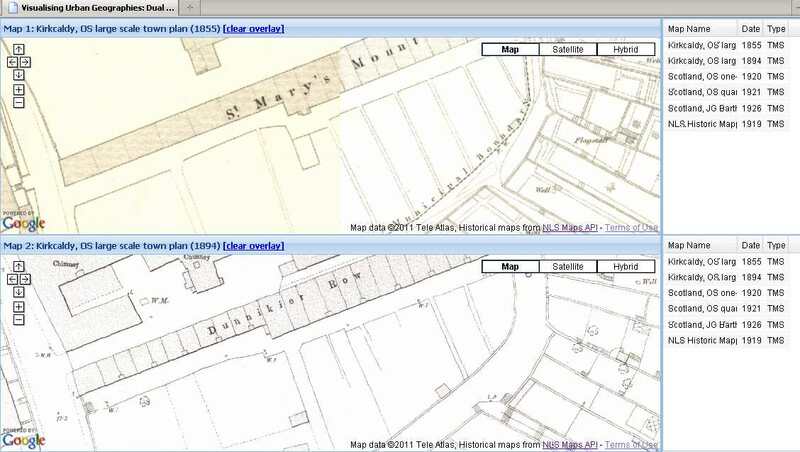 A few days ago, I blogged about the new map comparison tool from the Visualising Urban Geography project and lamented the lack of provision for maps outside Edinburgh. Chris Fleet, Senior Map Curator at the National Library of Scotland has kindly pointed out that if I pan to the area of the country in which I'm interested, if there are geo-referenced maps available for that area, they will appear in the list and can be selected. I've tried this out, and it works. However, I've also discovered that the map availability doesn't appear until you've zoomed in to an appropriate level. So, for example, starting from the initial view of the dual map tool, I zoom out 4 times to pan quickly to Jedburgh, and zoom in 4 times, the Jedburgh town plan of 1858 appears in the list and can be selected. Note that if the area of your view is outside the area on a specific map, that map won't appear in the list. So if know a map should be available (see the list of geo-referenced maps in the Map Library) but doesn't appear in the list, try panning around and zooming in or out. Of course, as I mentioned before, there aren't many geo-referenced maps for the Borders, however the view below shows the expansion of Kirkcaldy, Fife.